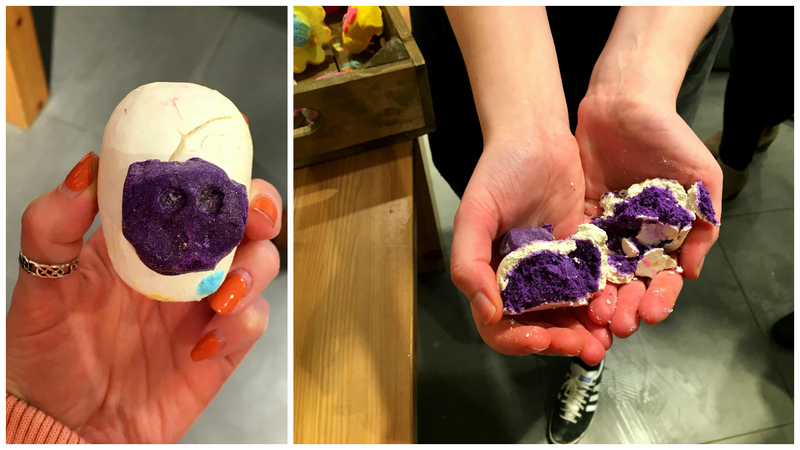 So this was a rather exciting end to my Thursday when I was invited to the Lush Bloggers Event at my local Lush in Kent and was able to get stuck in with some of the new goodies that are hitting Lush stores everywhere just in time for Mothers Day. Lush have released a completely unique and incredible range of Mothers Day treats for all the yummy mummies out there to give them that little bit of 'me' time and indulge in sweet, floral and musky scents whilst pampering their bodies and skin. I thought I'd just chat a little about some of the individual products that were demonstrated to us and the insightful knowledge given to us that evening about where the ingredients are sourced, harvested and transitioned into our favourite bath buddies. There were a handful of bath bombs up for grabs that are all connected to Mother Sunday some way or another, for example it could be the Neroli oil that brings a sense of comfort and is a very homely scent. A perfect example for a comforting scent would be the Baa Bar Bubble Bar that is filled to the brim with lavender, rose and ylang ylang, which oozes relaxing and chilled vibes for the ultimate bubbly bath. The colour of the water was a gorgeous, rich purple and filled the room with the smell of Palma Violets- one of my favourite smells! This kaleidoscope of colourful goodness was called the Ups-a-Daisy and reminded me of one of those little floating toys you had when learning to swim that you blew and it flipped over? However, this certainly never happened in the grotty old swimming pool- an explosion of colourful madness! I could literally have watched this all evening, every time we had a quick glance back into the bowel a whole new swirling of colours was emerging. Warning- you may never leave your bath once you've thrown this bad boy in! Your Mother Should Know bubble bar reminds me of the song 'Does Your Mother Know That You're Out?' by the God's that are ABBA. It instantly popped into my head once this delicious bar was crumbled up and awaiting the 'bath water' test to see what colours would seep out of this colourful goody. 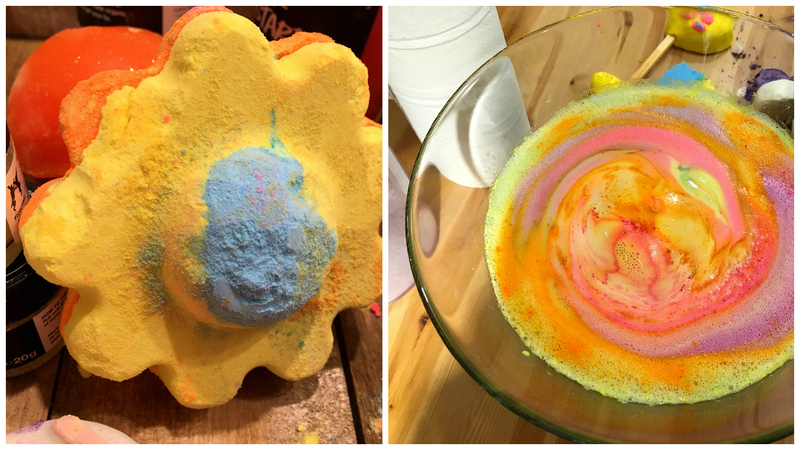 I think bubble bars are so, so good for getting your money's worth from a product as you only need the tiniest crumbly bit and your bath is an explosion of frothy goodness. 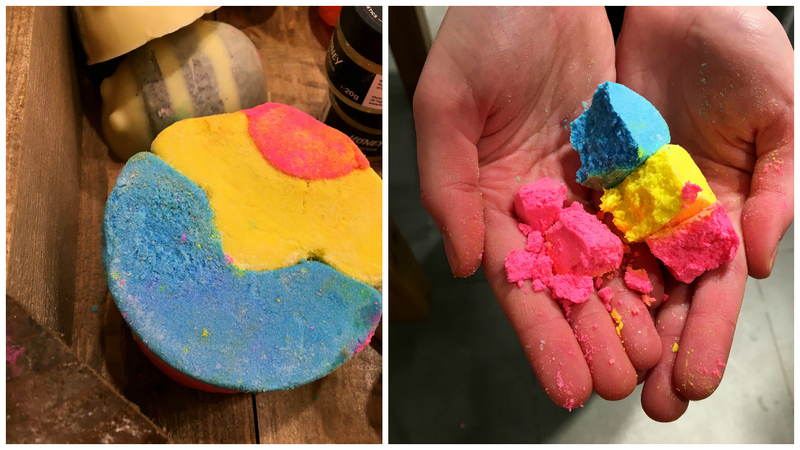 This bubble bar has a lot of 'mothering' scents to it as it contains the Neroli oil and the rosewood- both two very home like scents that are used in a lot of home fragrances. The final part of the evening really did get a little messy- but so, so much fun! We were lucky enough to get our hands stuck in and create our very own 'Angels on Bare Skin' cleanser. The ingredients were all measured out for us so it was a case of rolling on the rubber gloves and kneading all the ingredients together to make one dough like mixture, ready to be rolled and cut up for us incredibly lucky bloggers. I found out that everything we hunt in our Lush stores today is Vegetarian, which I think is an amazing statement to have underneath their belt. Of course nothing is tested on animals, which is one of the most crucial elements when buying cosmetics. I must hold my hands up and say that I'm not perfect at buying products that are 100% animal tested free on them but I am trying to be a lot more alert so that hopefully I one day can say I own nothing that is animal tested. Once again, thank you so much to the wonderful team at Lush Tunbridge Wells for having me for such a beautiful evening and thank you for the scrummy banana vegan cake!